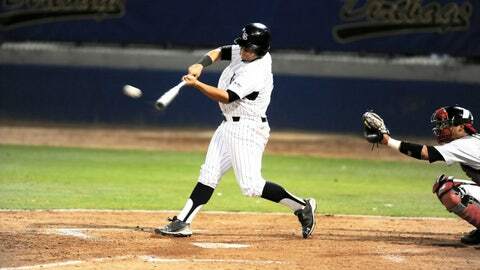 Senior Ino Patron is first in slugging percentage (.415) and second in RBI (31) for the Dirtbags. LONG BEACH, Calif. — The 2004 Long Beach State baseball team was known as the best team to never make the College World Series. Jered Weaver and Jason Vargas headlined a team that lost in the Super Regional Round, but the Dirtbags were never down for too long. Four years later, it was a team that was so loaded and so stacked a record 11 were drafted and six would reach the major leagues. But the 2008 Dirtbag team failed to make it out of their own regional tournament, replacing the one four years before it as the best team to never make the College World Series. But 11 draft picks opened some eyes and the program tilted in another direction. Go to Long Beach State, they said. You’ll be a big leaguer, they said. 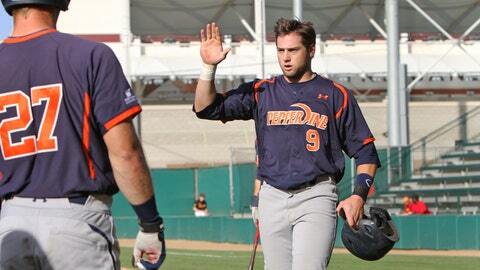 But go to rival Cal State Fullerton and you’ll go to the College World Series. When pitching coach Troy Buckley, a longtime part of the Dirtbag program, took the reigns as the head coach in 2011, he decided to put an end to that notion. This wasn’t the Dirtbag way. Now, for the first time since 2008, Long Beach State in the postseason after finishing second in the Big West. It earned the No. 2 seed in the Gainsville, Fla., Regional and has revived the unique culture of the historic program. "Those things have come and they’ve gone and I don’t know if we’ll ever get those things again and that’s fine if we don’t," Buckley said. "Hey listen, this program has got to get back to playing the way it needs to play, not just on talent alone but on execution and on makeup, and that’s what I’m proud of." The title of a Dirtbag, an insult anywhere else but in the city of Long Beach, is something that needs to be earned. In year’s prior, it wasn’t uncommon to see the team wearing their practice shirts turned inside-out after a bad loss. If you weren’t playing Dirtbag baseball, you didn’t get to wear the name across your chest. But when Buckley, who had been with the program since 2000, inherited a team that was coming off of its first two losing seasons since 1988, he realized winning wasn’t everything. In fact, it was the last thing the program needed at the time. "Just because you have that uniform and that label of being a Dirtbag, that has to be earned. It can’t be given to just anybody and I just tried to really stress that to the guys," he said. "Things aren’t just going to fall into place because you’re here, it’s a lot of hard work and a lot of things that need to occur in order for it to happen." On the field, the performances were marred by poor pitching, sieve-like defense and a reliance on the big hit – it was uncharacteristic Dirtbag baseball. The identity was lost and people with deep ties to the program were talking. "I’m human and you certainly hear those things," Buckley said. "But at the same time, you can’t let that affect what you have to do with your group. Some is warranted, some is not warranted and the bottom line is that youâre not going to appease everybody." Buckley began recruiting a different type of player. The cache of the Dirtbag brand was attracting high-profile talent, yes, but some were bolting for the draft instead of going to college and others just weren’t the right fit for the team. He developed players from within: Ino Patron, a Bay Area kid who grew up idolizing former Dirtbag Jason Giambi, was short and round and not a player being recruited by big time programs. But he showed up at Long Beach State camp with an infectious enthusiasm. Buckley took a chance on the kid no one else wanted and the first baseman has developed into a career .300 hitter. Josh Frye came from right down the street at Millikan High. Frye is 8-0 with a 1.51 ERA and gets to play in front of his family every weekend. "We never got the best players, per say, but we certainly got the right players," Buckley said. "Ino I think embodies what this program is: Not a highly sought after, not a high-profile guy, he doesn’t look the part, if you will, as far as a physical type. But boy, boy does he play the game with a lot of energy, a lot of competitiveness and a lot of talent as well." Finally, after all of the intangibles were taken care of, it was time to win on the field. To do that, they would need to return to their roots: Pitching and defense. "If we do those things, we’re going to have a chance to win every game," Buckley said. The puzzle won’t really be complete until they reach a fifth College World Series. But more importantly, tradition has been restored. Long Beach State is winning the Dirtbag way. "I think they’ve learned, they’ve grown, they have mental toughness and they’ve matured," Buckley said. "They had to put the whole thing together in order to win and then in order to embody what a true Dirtbag team really is."